Calling all Young Scientists ! Yes! all EHF needs are young scientists interested in project based learning. The first mentoring camp was conducted on April 26, 2013 at National Science Centre, New Delhi.Out of the 1000 plus entries received from schools across India, the top 100 students were invited to present their projects to the panel of judges from IIT, Delhi. Projects sent by 15 finalists included research on endangered species; a better understanding of tumours; an algorithm for safer encryption; a green method to clean water; a new kind of magnet and more. Eduheal Foundation, an international NGO was one of the Google Science Fair partners who helped make this competition possible by reaching out to the Indian schools in a large way. Prizes worth 50 lakhs will be awarded to participating students, teachers and principals by EHF. 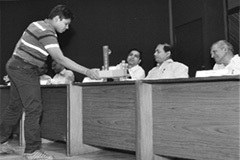 The judges were Prof. V.K Tripathi, Head, Department of Physics, IIT, Delhi, Prof. S.K. Gupta, Amar S. Gupta Chair Prof., Department of Computer Science, IIT, Delhi, Prof. P. Mishra, Prof., Department of Biochemical Engg. & Biotechnology, IIT, Delhi, under guidance of Prof. S.S. Mathur, former head, Department of Energy studies, IIT, Delhi, Advisor EHF and Dr. Sandeep Ahlawat, Prelim judge and Scientific accuracy checker, Google Science Fair and Managing trustee EHF.